Take a breath of fresh air in the quiet Bois de Boulogne park, stroll down the Champs-Elysees and the Place de l´Etoile, go shopping at the Palais des Congres on the Place de la Porte Maillot. 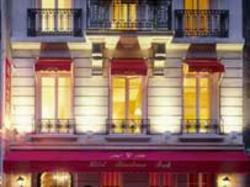 The Residence Foch Hotel and its renovated, quiet and cosy rooms bring you the wonders of residential Paris. .Underground + RER B : At Porte Maillot take the line 1 to the way of Château de Vincennes and stop at Châtelet Les-halles. Switch to the RER B to the way of Aéroport Charles de Gaulle. -->RER C : At Porte Maillot take the RER C to the way of Massy Palaiseau and stop at Pont de Rungis Aéroport d’Orly. -->Underground : At Porte Maillot take the line 1 to the way of Château de Vincennes and stop at Champs Elysées Clemenceau. Switch to the line 13 to the way of Saint-Denis Université and stop at Gare Saint Lazare. -->Underground : At Porte Maillot take the line 1 to the way of Château de Vincennes and stop at Gare de Lyon. -->RER C : At Neuilly – Porte Maillot take the RER C to the way of Massy –Palaiseau/Versailles – Chantiers/Dourdan/ Saint Martin- d’Etampes and stop at Gare d’Austerlitz. -->Underground : At Porte Maillot take the line 1 to the way of Château de Vincennes and stop at Charles de Gaulle Etoile take the line 6 to the way of Nation and stop at Gare Montparnasse. -->Underground : At Porte Dauphine take the line 2 to the way of Nation and stop at La Chapelle. -->Underground + RER B : At Porte Maillot take the line 1 to the way of Château de Vincennes and stop at Chatelet. Take the RER B to the way of Aéroport Charles de Gaulles and stop at Parc des Expositions.